The Pizza Press is one of the top pizza franchises in the southwest. With locations in California and Texas, this expanding network of newspaper-themed pizzerias is quickly becoming one of the most talked-about places for people to “publish” their own pizza. At the Pizza Press, customers come in and direct the chef about how to make their favorite pie. It is topped just how the customer likes it and is then “published” to perfection! 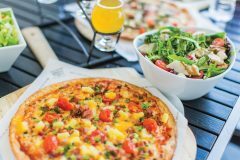 Pizza Press franchises are great spots for people of all ages — families can enjoy a delicious meal together while couples and adult groups of friends can enjoy a wide selection of craft beers. The Pizza Press is all about creating an atmosphere of fun and great food. Contact us to find out how you can open a franchise!